This left breast anatomical model with cancer nodule, Fibrocystic mass and plugged duct just below the surface of the areola. Soft tissue. Full size model is made of durable life-like material with anomolies. Model size: 6" x 4-1/2" x 2". Educational Card. 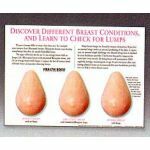 Suitable for OB-GYN, general anatomical study, training for breast self exams, surgical dissection, or for patient education/demonstration of procedures. Ideal for OB-GYN professionals, midwives, science teachers, healthcare and medical/anatomy educators, medical students and other healthcare professionals. May be used as instructional aids for public service organizations, e.g., American Cancer Society, Breast Cancer foundations, and other medical awareness and support groups for public instruction.